I can now confirm that the Mangrove, Cold Mac, Three Sisters, and Just Friends fit in the 4ms Pods. Woah, that’s beautiful! Is that a doepfer cv keyboard underneath it all or something you did custom? Such a pleasant vibe. That setup looks like a lot of fun! Question for the pod owners: I can’t quite tell from the pictures, but do the sides sit flush with the module faceplates? Yes, they do. It’s not totally evident from my photo above, but there’s a lip on the left and right edges of the unit which sit flush with the faceplate. I’ll try to remember to take a hi-res close-up tomorrow. 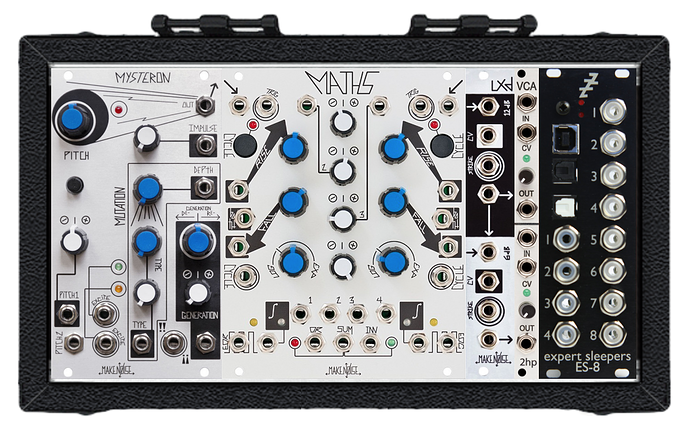 Surprising: I was in my local grabbing a pedal earlier and one of the staff was jamming on a Pod26 with Maths and a headphone out. That’s it. Low profile: People complain about the shallowness, but this is a massive feature for me. I was looking for a way of complimenting an 0-Coast, not dwarfing it. Idiosyncratic: The power brick is way larger and heavier than the unit. The “long” barrel cable accessory is actually really short. The 10-pin cable accessory is a must buy. The rails are drilled a bit unusually. I had a little trouble mounting Cold Mac; I had to do the old trick of thumbscrewing one knurlie, squishing the module down to mount the diagonally opposite screw, then doing the other modules like that before doing the final tighten. 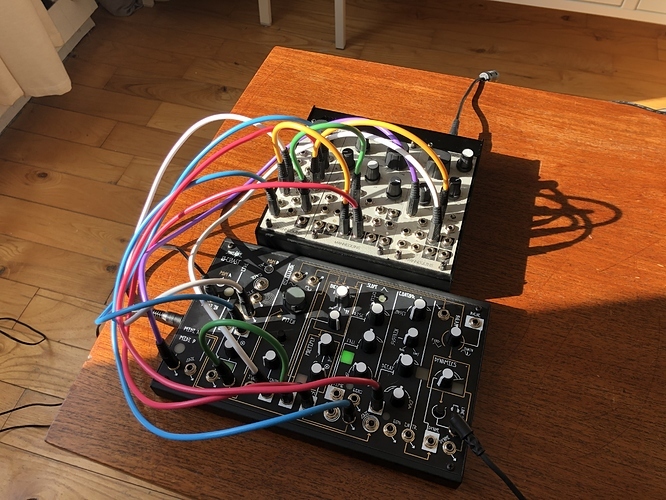 Just Friends is pretty unsuitable actually… there’s not much use for a ton of unattenuated, unipolar 0–8v envelopes or cycling ones. I’m currently running Maths and Plaits in Pod32. Cold Mac is my favourite module of all time, but compared to any other module or two between 10–20hp, Maths sort of also does what Cold Mac does with mixing, self-patching, rectification, envelope followin, analog logic, etc. Iwish there was a Pod-friendly 10–12hp EG/LFO with attenuation only to allow Cold Mac to do all the switcheroos as I call them. Let me know how you’re getting on and if you want to swap ideas. Cold Mac just… appears to orbit a troubled world, suddenly teleports down to the planet’s surface, then spends the rest of the film drunkenly explaining why this is all a case of mistaken identity. 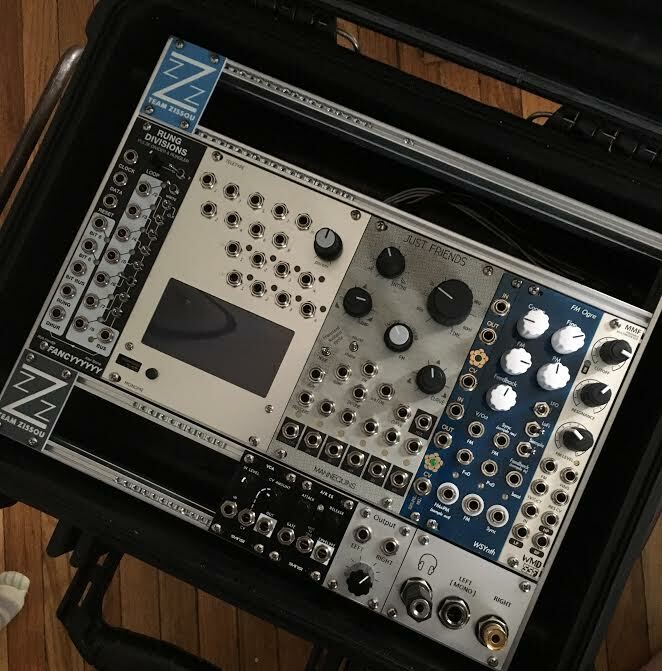 what plastic case is this? looking for something similar! Thanks! What keyboard is that? It’s amazing. love the Team Zissou panels!!! I just bought a red beanie the other day on a whim of Zissou inspiration. 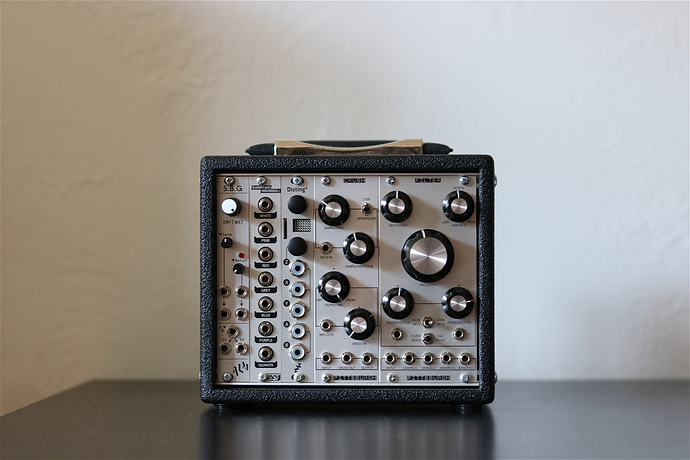 I’m getting back into Max and putting together some sequencing stuff, and considering this small case as a voice. This is what I’m thinking of doing with the wine box case I’ve been building. 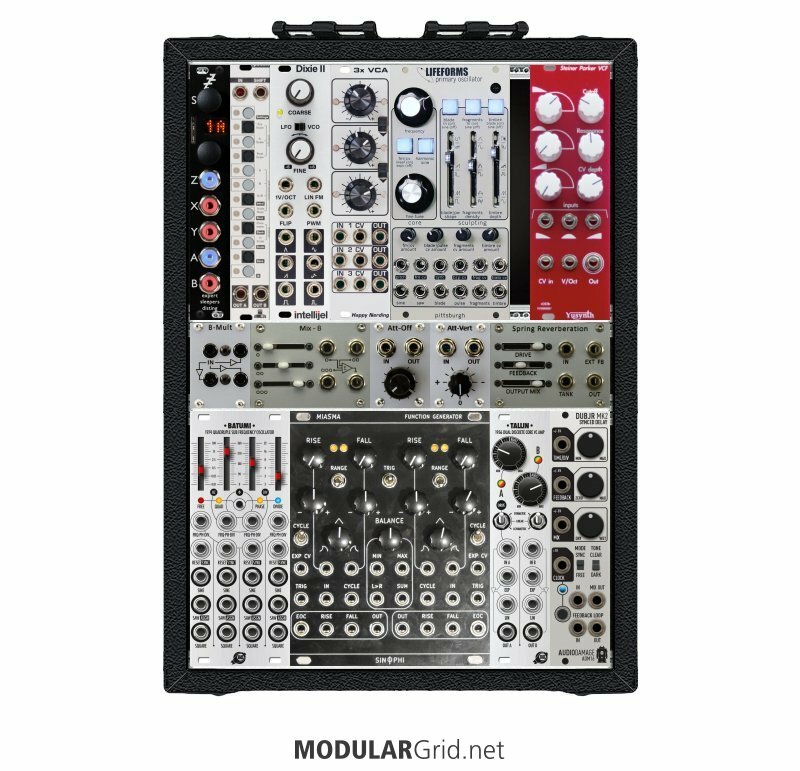 I’d be playing it with a keyboard and CV.OCD, or sequencing it from my larger case or Digitakt. I’m pretty set on the design aside from what’s in the bottom left. 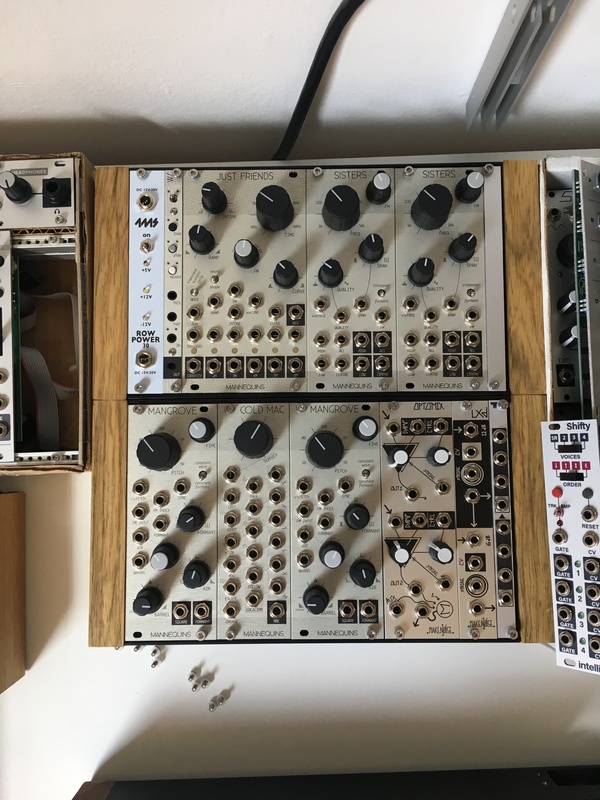 There’s a lot I can do with this voice–3 osc mono/paraphonic, 3 op FM, complex oscillators. I might do a Music Thing spring reverb instead of the SSF tool box, but I’ll have to wait until I’m further into it and see how I feel. 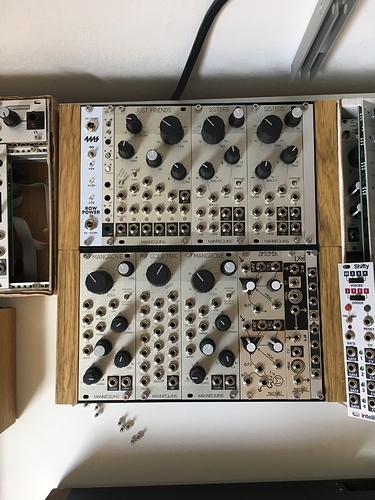 Also might go with a 6hp waveshaper and replace the Steiner-Parker filter with Three Sisters which would lend itself a bit better to the whole morphing philosophy I have going on here (plus i could technically even implement full 3 voice polyphony with that) but I just love the tone of this Steiner filter so much. 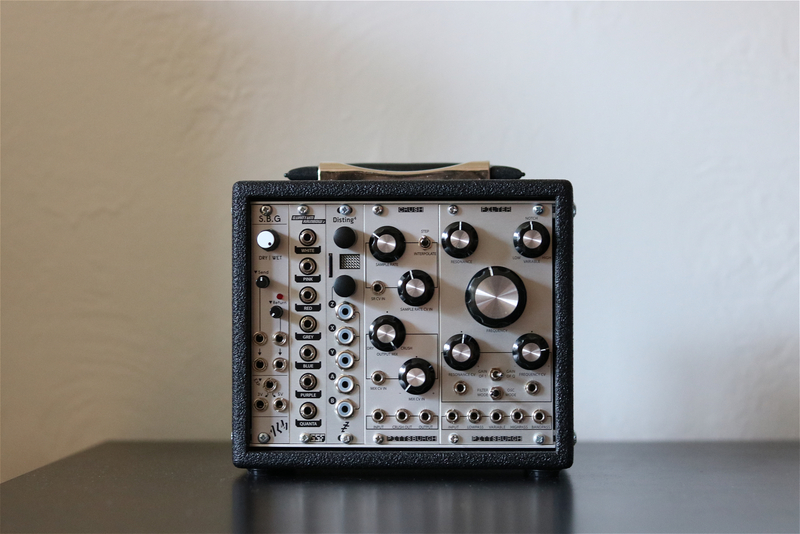 Another thing I’m really curious to try is replacing the Toolbox and mult with a Doepfer Theremin controller. I feel like that could be a lot of fun to control patch morphing with.